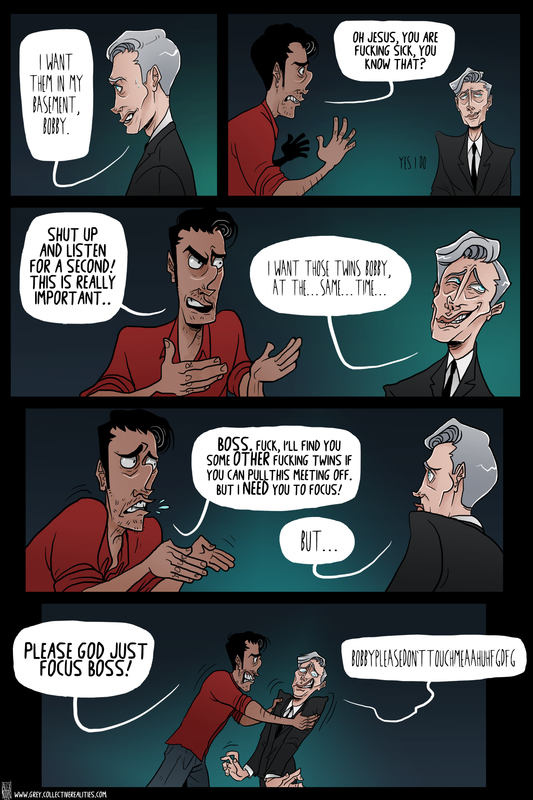 I think we can all sympathize with Bobby’s frustration….Boss PLEASE. FOCUS. For once in your life think about something other than horrible, horrible murder. Hey we are compiling questions for the GREY characters to answer! Answers will go on Patreon and on social media pages in either written format or in doodle format! Send us your questions on FB or Tumblr and check out our Patreon! this is the most expressive i’ve seen Boss get and its kinda unnerving. also i’m loving the bobby and boss banter/dynamic more than i thought i would oh no. Everyone of Boss’ faces give me the mega-creeps in ways I never want to explore dear GOD.